BOULDER, Colo. — The Boulder County NAACP says a second controversial arrest of a black man in a month is all the more reason for a community oversight committee. Sammie Lawrence recorded police ticketing a group of homeless people eating lunch in a park Friday. Officers asked him to step away and put down his weapon, a large staff with a dragon carved at the top. But Lawrence refused to comply with the officer's orders. “Do you see that little rubber thing on the bottom? This is a walking aid?" Lawrence is heard telling the officer in the video. "Ay ADA law, I am legally able to have this wonderful device to help me stop having seizures." Soon after, the officer kicks Lawrence's walking stick away and takes the 26-year-old man down to the ground. Lawrence was hospitalized and then jailed for resisting arrest and obstructing a peace officer. He shared photos of his bloody knees with the NAACP. 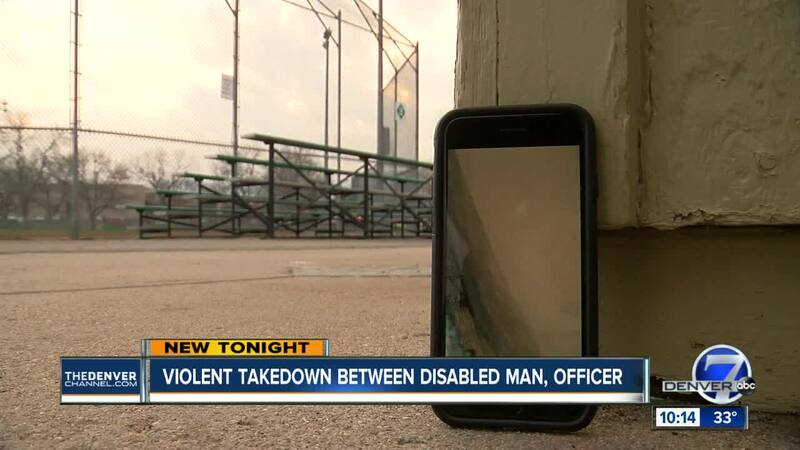 The video calls attention to a police department that's already in the national spotlight. In March, a video showing Boulder Police officers detaining a black man picking up trash in his front yard sparked outrage. There is an independent review of that case, and the city agreed to form a community oversight committee. “With a community oversight committee, we can convey police are supposed to protect and serve us, and we actually expect that,” said O'Connor. We reached out to Boulder Police Department and the police union multiple times, but they would not comment. They did tell our partners at the Daily Camera that the incident was reviewed by command staff and an internal investigation is not warranted at this time.